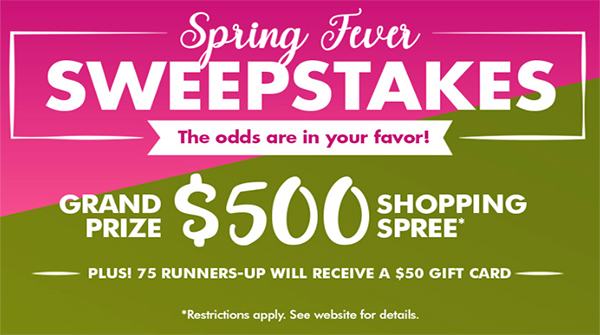 Enter between now and Friday, April 5 for a chance to win* a Dollar Tree shopping spree. They will select winners at the end of the week to show you how we are celebrating the change of the season. One winner will receive a grand prize of one (1) $500 Dollar Tree gift card. There will be seventy-five (75) runnerup winners who will receive one (1) $50 Dollar Tree gift card. winners will be selected at random from among all eligible entries received. 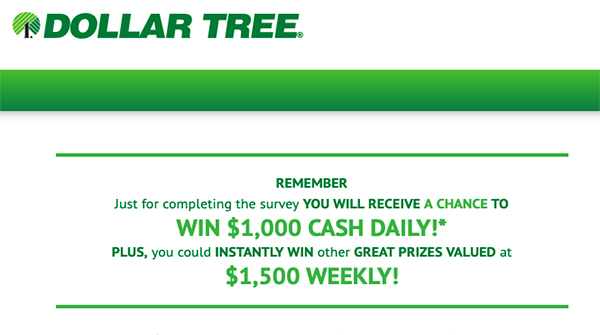 www.dollartreefeedback.com Here’s Another Sweepstakes: Dollar Tree Customer Appreciation Sweepstakes. Please Visit www.dollartreefeedback.com and follow the onscreen instructions to enter their survey for a chance to win. Just for completing the survey YOU WILL RECEIVE A CHANCE TO WIN $1,000 CASH DAILY! 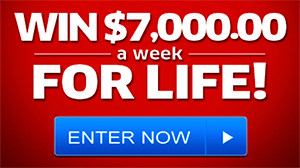 * PLUS, you could INSTANTLY WIN other GREAT PRIZES VALUED at $1,500 WEEKLY!